Swimming with bottlenose dolphins is an experience like no other, so don't miss the Dolphin Royal Swim Plus while you are in Los Cabos. Guests will have the opportunity to interact with dolphins, which includes participating in the famous Dorsal Tow and Foot Push. The tour also includes additional features such as a buffet and open bar. If you are going on vacation to Los Cabos in the near future, then a swim with bottlenose dolphins is an experience that is unmatched. The Dolphin Royal Swim Plus offers guests an adventurous dolphin encounter that will make lifetime memories. When you participate in the Dolphin Royal Swim Plus, you will get to swim with two dolphins in the Pacific Ocean. You will even have the chance to learn about the bottlenose dolphins from our knowledgeable staff. The Dolphin Royal Swim Plus gives visitors the chance to participate in the unique Foot Push, which starts out with two bottlenose dolphins pushing you from the soles of your feet up to the surface of the water while you are in a superman position. The foot push will make you feel as if you are flying. 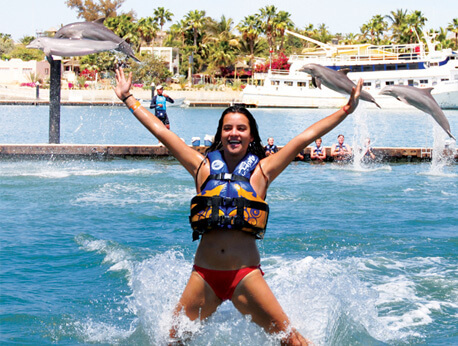 Another fun activity offered at the Dolphin Royal Swim Plus is the Dorsal Tow, which is where you hold on the the dorsal fins of a dolphin as the aquatic mammal pulls you through the water. Guests will also receive a hug and a kiss from a dolphin, and they will get to participate in a variety of interactive activities with dolphins. Aside from the interaction with dolphins, guests also receive a buffet with an open bar, a bike tour, a 20-minute ocean ride tour, a camel trek, and roundtrip transportation. For an additional cost, guests can also receive pictures of their interaction with the bottlenose dolphins, which is a great way to share the experience with others. For those who are interested in the Dolphin Royal Swim Plus, the price is $99 for children ages 6-12 and $189 for those who are 13 and older. The tour is offered daily and lasts around 60 minutes, which does not include the briefing. Upon arrival, the first 15 minutes includes a briefing, which is followed by 50 minutes in the water with the dolphins. The tour finishes with guests paddling in kayaks for 10 minutes. Although guests as young as 6 can participate in the Dolphin Royal Swim Plus, only guests older than 8 can take part in the Foot Push and the Dorsal Tow. It is advised that visitors arrive about 30 minutes before the tour begins to ensure the briefing does not interfere with the time allotted for activities.